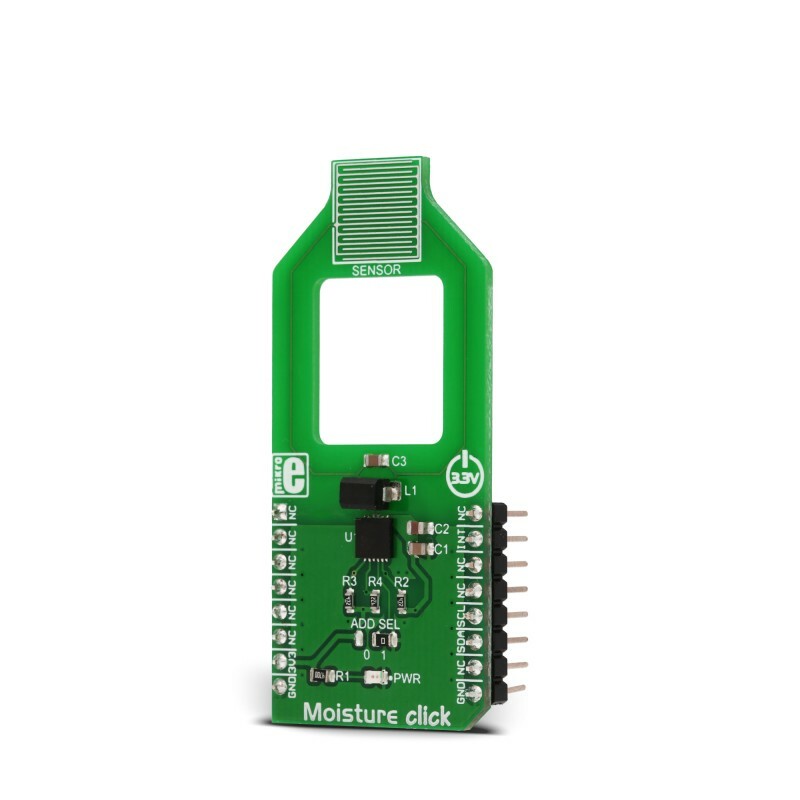 Moisture click is a Click board™ that can be used to easily detect a moisture level of the skin, by simply touching the sensitive surface of the PCB. 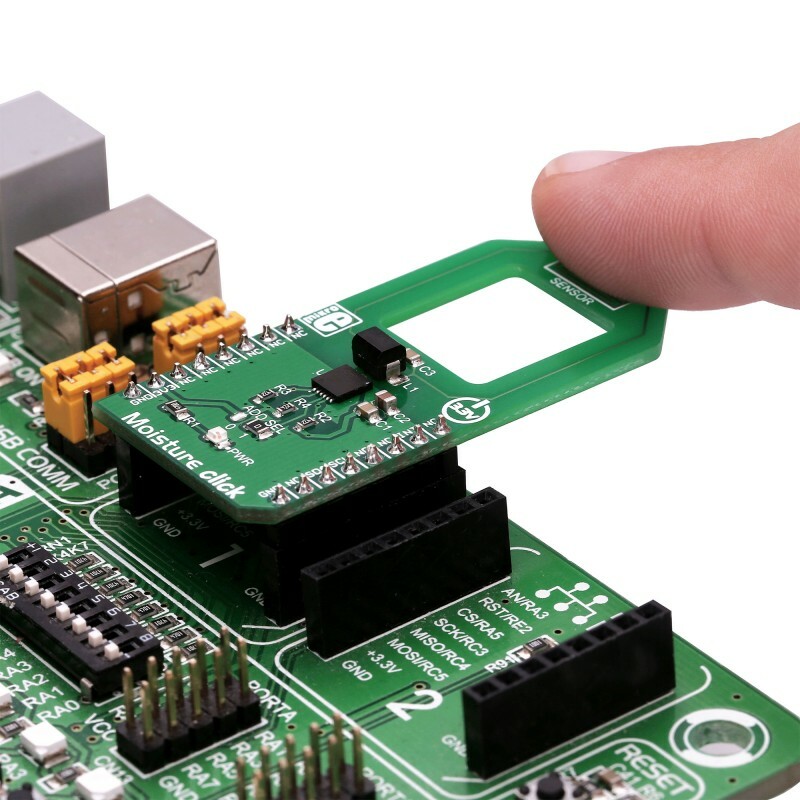 The Click board™ is equipped with the printed copper trace sensor, which is sampled by the accurate FDC2112 IC, a 12bit capacitance to digital (FDC) converter, which employs innovative noise and EMI resistant capacitance measuring techniques. This sensor allows the Click board™ to measure the skin moisture by measuring its capacitance, which changes depending on the skin moisture level (hydration state of the outer epidermis). The simplicity and a low number of external components required for operation, make the FDC2112 IC an ideal solution for using it in a range of different applications that are based on the capacitance measurement. 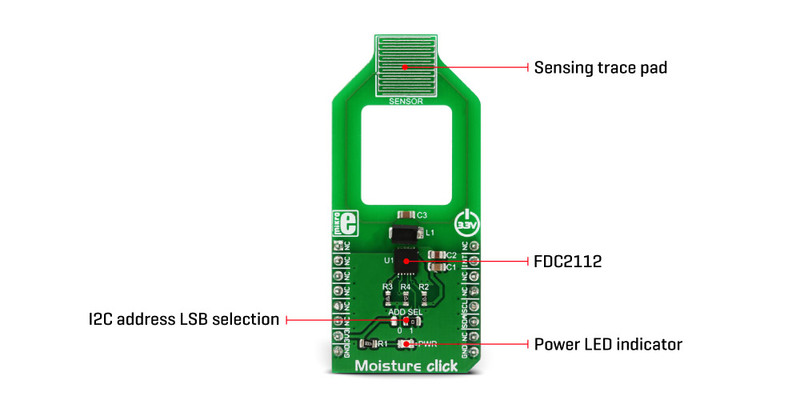 The Click board™ allows evaluation of the FDC2112 IC, utilizing it for a range of skin hydration and moisture measurement applications, which involve an accurate and reliable measurement of the capacitive properties of the skin, in order to determine the percentage of hydration or moisture. As already mentioned, the working principle of the Moisture click is based on measuring the skin capacitance property in order to determine the skin moisture level or hydration state of the outer epidermis. The studies show that various skin hydration measurement methods are complementary and no single method gives 100% accurate result for all skin conditions. However, measurement of the capacity turned out to be the most effective and reliable of measuring the skin hydration. Therefore, Moisture click uses the FDC2112 IC, a very precise 12bit capacitance to digital converter, from Texas Instruments. The main challenge for all the capacitive sensing applications is the presence of EMI and noise, which can reduce the sensitivity. The FDC2112 IC employs an innovative narrow band architecture, which reduces the electromagnetic interferences (EMI) and noise influence. It uses an L-C resonator, (L-C tank) and monitors changes of its resonant frequency, which occurs as a result of a change in the capacitance. The IC features an internal referent frequency generator, which is compared with the measured oscillation frequency of the L-C tank. The 16bit conversion result is stored on the 12bit output registers, and it is available via the I2C interface. The digital gain function allows a higher dynamic range of the measurement to be obtained, by shifting the internal 16bit value. The device features 2 internal sensing channels, of which only one is required for this application. There are two connections, IN0A and IN0B, forming the necessary L-C resonator circuit, along with the copper trace that serves as the capacitance sensor. By placing a finger on the pad, the capacitance of the resonator is changed, and the frequency is shifted. This frequency shift is measured and stored at the output registers. The working parameters of this circuit can be configured by the appropriate registers, such for example - the input deglitch filter which suppresses EMI and ringing above the sensor frequency, conversion time, sequencing mode through the channels, and so on. The FDC2112 datasheet offers a complete description of all the registers and their functions. There are two power modes available, used to reduce the power consumption. The device goes into the Sleep mode right after the POR (Power-ON Reset), waiting to be configured. When the Sleep Mode Enable bit in the status register is cleared, the device enters the Normal mode, ready to make measurements. The manufacturer recommends configuring the device only while in the Sleep mode. If frequent data acquisition is not required, the device can be put into the Sleep mode between the readings, saving power that way. The configuration data is retained in this mode, and the I2C interface is operational. The configurable INTB pin of the FDC2112 IC can be used for the host controller notification. It can be configured to notify the host MCU for a range of different functions, including data ready event, watchdog error, amplitude too low or too high error, etc. Each of these events can be set to raise a flag and be reported by asserting the INTB pin. This pin is open-drain configuration and it is pulled to a LOW logic level when asserted. It is routed to the mikroBUS™ INT pin. I2C address of the FDC2112 IC can be selected with the SMD jumper labeled as ADD SEL. This jumper sets the state of the least significant bit (LSB) of the I2C slave address, to either 0 or 1, according to the jumper position it occupies (labeled as 0 and 1). 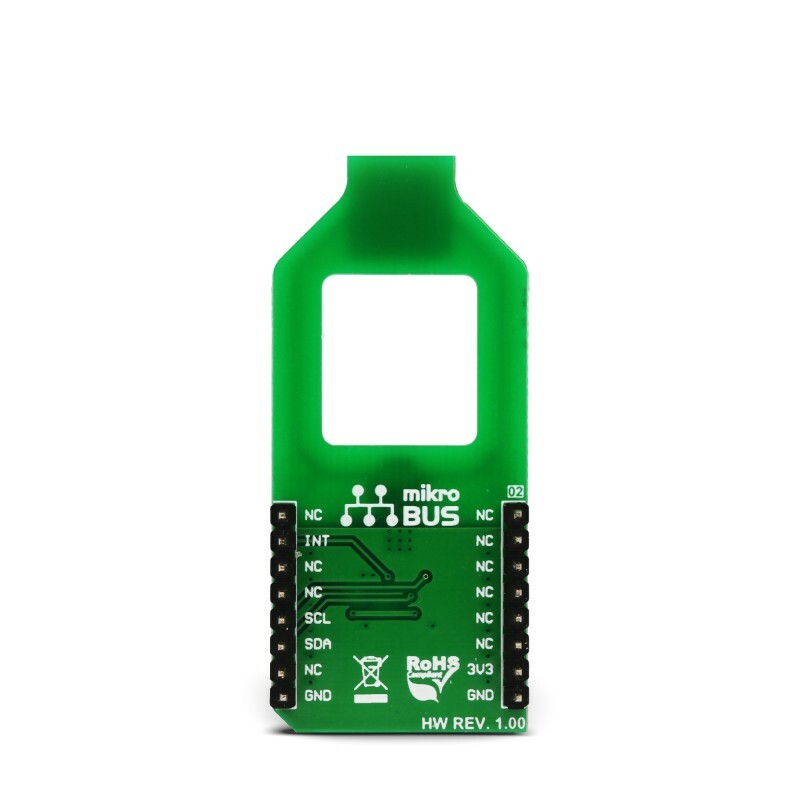 Lines of the I2C interface are routed to the appropriate mikroBUS™ pins (SCL and SDA) providing an easy and reliable connection with the host MCU. This Click board™ requires only 3.3V for the operation and it should not be interfaced with the MCUs operating with 5V signal levels without a proper logic voltage level shifter. This table shows how the pinout on Moisture click corresponds to the pinout on the mikroBUS™ socket (the latter shown in the two middle columns). We provide a demo application for Moisture click on our Libstock page, as well as a demo application (example), developed using MikroElektronika compilers. The demo can run on all the main MikroElektronika development boards. The library initializes and defines the I2C bus driver and drivers that offer a choice for writing data in the register. The library includes a function for calibration chip for measurement, a function for reading moisture data. The user also has the function for initializes chip, set offset, gain and clock divider and software reset. uint8_t moisture_getData() - Functions for measurement data in percent. Application Initialization - Initializes Driver init and sets moisture gain, offset data and clock divider. Calibration chip for measurement - don't touch the sensor while calibrating. Application Task - (code snippet) - Measure moisture data in percentage every 500ms. To make the measurement successful, touch the sensor and wait until values are stabilized.